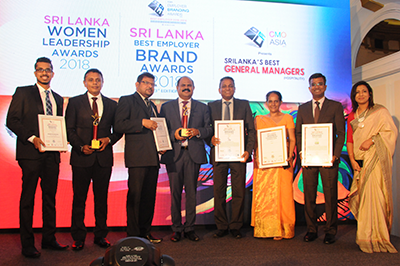 Sri Lanka Telecom (SLT), the national ICT solutions provider was the proud recipient of three awards at the prestigious Sri Lanka Best Employer Brand Awards held at the Taj Samudra Colombo recently. SLT Group Chairman, Mr. P.G. Kumarasinghe Sirisena, CEO of SLT – Mr. Kiththi Perera, Chief Operating /Technology Officer of SLT – Mr. Priyantha Fernandez, Chief HR Officer of SLT – Mrs. Indrani Hissalle and Chief Customer Officer – Mr. Roshan Kaluarachchi attended the ceremony and accepted the awards on behalf of the company.